Ghana has a rich musical heritage and the highlife genre originates from there. 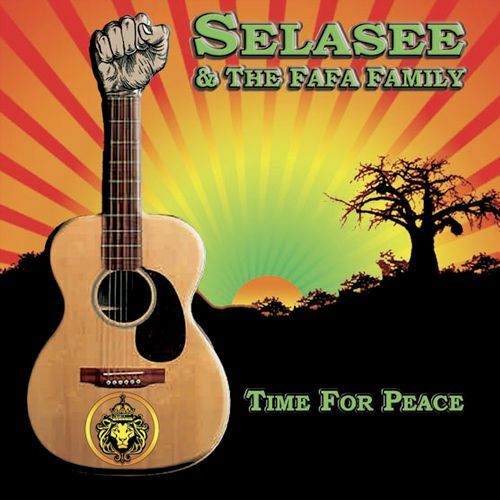 And Ghana native Selasee – who today resides in the U.S. – has incorporated elements of this often up-tempo and funky genre on his and his band Fafa Family’s third album Time For Peace, a set that follows their African Gate, released in 2009. Time For Peace is Ghanaian styled roots reggae with elements of soul and gospel. The set is produced by no other than the legendary Aston “Family Man” Barrett, longtime bass man who worked close to Bob Marley for almost a decade. Together, Aston Barrett and Selasee & Fafa Family have created a catchy reggae album connecting the musical dots between the Caribbean, West Africa and the U.S. This organic set is a conscious one and the songs have a story resonating from Selasee’s own experiences in life. But Selasee also tackles global issues, as on album opener Time For Peace where Jamaican deejay Anthony B joins in chanting about the trials and tribulations going on in the world. The roots vibe is strong on several tracks, especially on deep and slow cuts like Baby Sister and The Love, whereas highlife influences are a large part of tracks such as Mama Africa and Which One. Several of the songs have long instrumental parts where the multiple guitars or the breezy horns do most of the talking. And the horns on Time For Peace are, well, marvelous. Listen to Fly Away, especially the smooth saxophone solo, or the funky saxophone on sensual reggae funkster Stop the Rain. All songs are powered by Selasee’s rich, soulful and slighly raspy voice. Just as several other reggae greats he started singing in church, but he has also been in an afro-pop band, and all these elements blend together nicely on this twelve track set.